Socrates was born in 469 B.C, in a small village on Mount Lycabettus, a short distance from Athens. His father Sophroniscus, was a stone mason and sculptor. As a child Socrates received a basic education and he was soon apprenticed to his father. Socrates worked as a stone mason for many years. While still a young man, he studied under the Greek philosopher Achealaus. Achealaus taught him mathematics, astronomy, as well as the teachings of the earlier philosophers. 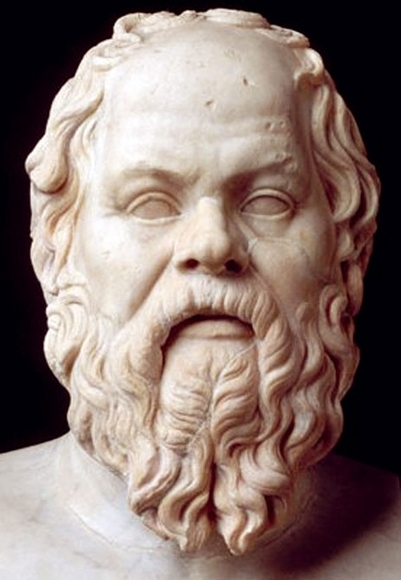 Much of what we know about Socrates appearance we know from Plato's Symposium. In the Symposium Plato describes him as being short, stocky, with a snub nose, bulging eyes, and protruding lips. Socrates also had bow legs, a big stomach, and was bald. He always wore a tunic with a threadbare half-length cloak. Socrates was not considered to be very attractive. When he reached the age of 18, Socrates was required to serve as a citizen soldier. At this time, all Athenians were required to serve in the military between the ages of 19 and 60. Socrates served in the armored infantry which was called the “hop lite.” He was a private third class. This meant that he fought with a long spear, shield, and face mask. Socrates fought in numerous battles. During these conflicts he gained a reputation for bravery. At the age of 50, Socrates married a much younger women named Xanthippe and they had 3 children. Their names were Lamprocles, Sophroniscus, and Menexenus. Socrates was almost always broke. He did not like to do physical work and he made a meager living teaching philosophy. Socrates also devoted very little time raising his children. He taught his philosophy lessons on the streets of Athens. Socrates questioned almost everything. Probably the best known statement attributed to him is, “the unexamined life is not worth living.” Socrates was not in favor of democracy, and he did not like to get involved in politics. When he was 65, the Peloponnese War ended in the defeat of Athens, and the new victorious Spartan ruler Lysander established a government sympathetic to Sparta called the Thirty Tyrants. Those who believed in democracy fled Athens, but Socrates stayed. One of the leaders of the Thirty Tyrants was a former pupil of Socrates named Critas. Critas issued an edict banning the teaching of philosophy on the streets of Athens. In the edict he mentioned Socrates. He feared that Socrates would twist his words, and he wanted nothing to do with it. However, in the 5th century almost everyone was involved in Athens politics, and the Thirty Tyrants wanted to involve as many people as possible in their reign of terror. Then, one day Socrates and four others were called before the Tyrants. They were told to sail to the island of Salamis and arrest the democratic leader named Leon. Socrates knew that Leon would be killed if he brought him back to Athens. He ignored the orders and returned home. He could have been killed for it, but he got lucky when the Thirty Tyrants were deposed and Critas was killed. The democrats were now in charge and a lot of them did not like Socrates. In 399 B.C., Socrates was arrested and charged with ungodliness and corruption of the youth. The trial took place in front of 500 men who were chosen from the general free population of Athens. The case was presented by Meletus who demanded the death penalty. However, Socrates refused to defend himself. At the end of the trial the vote was 280 to 220 in favor of the death penalty. When Socrates finally spoke he told them that instead of the death penalty he should be granted a place at the Prytaneum, which was the sacred hall of Athens' heroes. This made everyone roar in disbelief. A short time later, they gave him a large glass of hemlock and he drank it down and died.